There are hundreds of USB audio interfaces out there in all shapes and sizes. Most computers nowadays are equipped with USB 3 ports, but until now, few audio manufacturers have come up with interfaces designed to exploit this newest version of the protocol. Given that USB 3 is backwards–compatible, and that USB 2 offers enough bandwidth for most recording applications, the potential gains from developing USB 3–specific hardware and drivers perhaps haven’t justified the costs of doing so. However, PreSonus’s Studio 192 is billed as a USB 3 interface; and as if to make the point, it ships only with a USB 3 cable. It’s a cross–platform product that is compatible with Mac OS 10.8 or later, Windows 7 SP1, Windows 8 and Windows 10. The 192 is a 24-bit/192kHz 1U rack device which offers two front–panel mic/instrument inputs (on combi balanced XLR/unbalanced TS jack), with a further six mic/line balanced inputs on the rear. They are joined there by 10 balanced analogue line outs, two pairs of optical digital inputs and outputs that can deliver up to 16 additional channels using the ADAT protocol, coaxial stereo S/PDIF in and out, and word-clock I/O on the usual BNCs. Also present is a socket for the rather flimsy–looking external PSU, and of course, a USB 3 socket. There is, however, no MIDI I/O. Most of the front panel is taken up by metering and monitoring arrangements. There are two headphone outputs, each with its own level control, and a large master volume control. This, incidentally, is not an assignable controller but a proper analogue gain control, hard–wired to the balanced main outputs. The main outputs and each of the eight analogue inputs have eight–LED ladder meters, with a further blue LED on each input that lights up if phantom power is active. There are dedicated buttons for Mono and Dim/Mute, plus a built–in, one–button talkback system. The Studio 192’s back panel is certainly not under-endowed in the connectivity department. Only inputs one and two and the two headphone outs are found on the front panel. One of the most interesting aspects of the 192’s design is its use of remotely controllable (digitally controlled analogue) preamps. 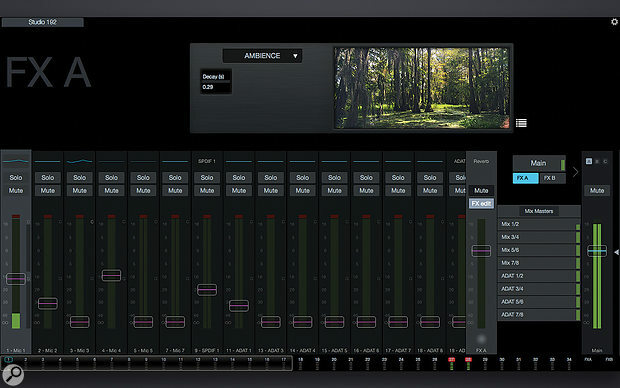 Preamp gain and phantom power can be configured digitally either from the front panel of the unit, from PreSonus’s supplied UC Surface control–panel software, by sending MIDI Continuous Controller messages from your DAW, or directly within the mixer of PreSonus’s own Studio One recording software. What’s more, if you expand your 192 by adding one or two of PreSonus’s DigiMax DP88 preamps, you can control those too. DAW control means you can store preamp settings with your recording session, which might be useful should you need to add extra material to it at a later date. Alternatively, you could make the phantom power LEDs blink on and off in time with your music. Another welcome feature is that although the use of ‘combi’ jack/XLR sockets means the six line inputs share physical connectors with mic inputs 3–8, they bypass the mic preamps completely on the way into the unit. The core technology in the Studio 192 builds on the DSP mixing features of PreSonus's FireStudio interfaces, but from the user's point of view, the 192 is perhaps closer to the AudioBox 1818VSL, a USB 2 interface with a nearly comparable selection of inputs and outputs. When I reviewed the 1818VSL in August 2012, I felt an otherwise good product was let down by the accompanying Virtual StudioLive control–panel software, which was inflexible and confusing. No doubt Virtual StudioLive has improved since I last used a PreSonus interface, but as far as the Studio 192 is concerned it’s a thing of the past, replaced by an entirely new utility called UC Surface. When you fire up a Studio 192, what greets you is a small launcher application called Universal Control AI. This offers pop–up menus for things like sample rate and buffer size — most of which only actually do anything in the Windows version — plus a picture of a Studio 192. Clicking on the picture takes you to UC Surface proper, and it’s immediately obvious that this represents a radically different prospect compared with Virtual StudioLive. The primary motivation behind PreSonus’s redesign, it would seem, is the desire to make UC Surface ‘touchable’ for those using multi–touch screens. So, there are no menus, rotary controls or fiddly buttons, and everything has been made as large and widely spaced as possible. Like much of today’s music software, it is also relentlessly, bleakly, existentially grey. UC Surface provides three main areas. The mixer itself occupies the left side of the lower half, and displays no fewer than 36 channels. These can’t be reordered, hidden or made smaller, so unless you have a truly mahoosive screen, you’ll need to do a fair amount of scrolling backwards and forwards. This is done by swiping sideways in an overview at the bottom, which has some useful properties of its own: miniature meters for all channels are visible here, and touching or clicking on a channel in the overview centres the main mixer on that channel. The main UC Surface display, with the context–dependent top half of the screen showing the Fat Channel EQ window for mic input 1. Talkback configuration lurks behind the small white arrow at the extreme right, and you access the headphone routing configuration options by touching the icon at the top of the Main fader. This took me a while to figure out! To the right of the fader area is a master section which is always visible, though what it actually displays can vary. The top half of the UC Surface window, meanwhile, is context–related. Touch a channel to select it, and you’ll see a channel strip displaying all the controls that are available for that channel. For the analogue input channels, that’s quite a lot: as well as preamp gain, phantom power and polarity switches, you also get a stereo link button, a gate, a compressor/limiter and a four–band EQ. The first eight ADAT inputs benefit from the same ‘Fat Channel’ processing options, whereas the other digital inputs offer merely a polarity switch. The context–sensitive area also allows the selected channel to be renamed, though it would be easier if you could do this simply by clicking the name at the bottom of the channel. My experiences with UC Surface are described more fully in the box; in sum, it is enormously powerful, but aspects of it are not as intuitive as they might be. It turns out that this is because the Studio 192 uses Apple's class-compliant driver, which did not support audio streaming over USB 3 until Mac OS 11.3. However, since it also transpires that the Studio 192 has no functionality that isn’t also available over USB 2, this is perhaps no loss unless you happen not to have a USB 2 cable handy. I also installed UC Surface on my Windows 7 tower PC, to be greeted by another firmware update. It turns out that the Universal Control AI launcher insists on performing an update if the 192’s installed firmware is different from the version the launcher contains, not merely if it’s newer. This means that if you connect a Studio 192 with the current firmware to a computer running a slightly older version of UC Surface, you won’t be able to use it until you’ve ‘updated’ the firmware to the older version. Strange, and quite annoying if you often use the 192 with multiple computers. PreSonus explained that this is because they want users to have the option of staying with or reverting to older firmware and control-panel versions that they know to work on their own machines, rather than always being forced down a 'forward' upgrade path. Once its firmware was up to date, the Studio 192 and my Windows machine did at least pass audio over the supplied USB 3 cable. However, performance gains compared with USB 2 were elusive. On Windows, the Universal Control AI launcher utility gives you a choice of buffer (or, as PreSonus call it, ‘Block Size’) settings which run from 64 samples to 4096. There’s also a choice of Safe Mode options which runs from ‘Minimum Latency’ at one extreme to ‘Extra Safe’ at the other, though at small buffer size settings, only the lowest of these are available. The Block Size defaults to Auto, which presumably is the software’s attempt to guess at a setting that will work on your system, and produced horribly garbled playback on my PC. Setting the Block Size manually proved more successful, but my results were unpredictable. My Windows 7 studio computer is no longer in the first flush of youth, but it usually works fine at 44.1kHz with a 256–sample buffer for USB 2 and Firewire interfaces. This wasn’t always the case with the Studio 192: with the Block Size set to 256 and Safe Mode set to Standard, playback was often garbled. Even at 512 samples, I sometimes needed ASIOguard enabled in Cubase for reliably glitch–free operation. At other times, though, I could set the buffer size to 256 or even 128 samples and it would work perfectly well. PreSonus pinned the blame for this on the fact that the driver version I tested permits the user to select non–optimal combinations of Block Size and Safe Mode, and say they are confident they have resolved the issue in a driver update released after we went to press. In an ideal world, a 128–sample buffer size at 44.1kHz should deliver a round–trip latency of 256 samples, or just under 6ms at 44.1kHz. In practice, converter latency and safety buffering will add to this, and the Device Setup window in Cubase 8 reported the total latency as being 7.8ms. However, when I used Oblique Audio’s RTL Utility to measure the unit’s real–world performance, it turned out that audio was in fact taking around 14ms to make the round trip, equating to a total latency of over 600 samples even with Safe Mode set to Minimum Latency. At a 256–sample buffer size, the lowest round–trip latency I could achieve was over 850 samples — approaching a 20ms delay, and substantially worse than the 686 samples I measured with the same buffer size on PreSonus’s older 1818VSL over USB 2. I tried connecting the Studio 192 with a USB 2 cable instead, and its performance did not change. Thinking perhaps that things might be better on a newer computer, I also contacted Vin Curigliano of AAVIM Technology, who maintains the invaluable DAWbench database of Windows audio interface performance stats. He repeated my tests in a high–spec new machine (albeit still running Windows 7) and recorded exactly the same round–trip latency figures for all buffer size settings. There are no Safe Mode options to choose from on Mac OS, but the 192 was happy to run at the lowest available 32–sample buffer size with my MacBook Air, despite the lack of USB 3 support. At 44.1kHz, this should in theory yield a round–trip latency of 64 samples, or 1.5ms. In practice, unsurprisingly, this was not realised. The reported round–trip latency in Studio One was actually 297 samples, or just under 7ms. This is the latency for which Studio One compensates, so if this figure was precisely accurate, then an audio part re–recorded through a loopback cable would line up perfectly with the original. When I did this, I found that my re–recorded parts were delayed by a further 160 samples or so. This means that in the real world, the lowest achievable round–trip latency under Mac OS is about 460 samples, or more than 10ms. This is about on a par with the result that should be possible at the lowest 64–sample buffer sizes on Windows, the difference being that my Mac would actually work with the 192 at the lowest setting (albeit with considerable CPU overhead). The disappointing but inescapable conclusion is that, when it comes to round–trip latency, the existing Studio 192 USB 3 software not only offers no improvement over USB 2 and Firewire drivers, but is actually worse than nearly all of them. At base sample rates, it is impossible to achieve a round–trip latency of less than 10ms on Mac OS or Windows. The version I tested also reported highly inaccurate latency figures to the host DAW, which can cause issues if you run external hardware inserts. I raised these issues with PreSonus, and it turns out that the root cause is the UC Surface DSP mixer and its built–in Fat Channel processing. Audio routed through the mixer incurs an additional delay of 4ms or so on top of the latency caused by input and output buffering. In the current driver version, this additional latency is not reported to the host DAW, and can’t be avoided even if you eschew the delights of the Fat Channel or disable the mixer altogether. PreSonus told me that they expect to have a new driver version available by the time you read this which will report its latency correctly. In the longer term, they also hope to introduce a mode whereby bypassing the UC Surface mixer will eliminate its additional latency, though no timeframe has been provided for this development. PreSonus are clearly very proud of their Fat Channel, and seem to feel that its inclusion means most users won’t want or need to monitor signals through their DAW with low latency. There is something to this, especially if you are using their own Studio One DAW, where the DSP Fat Channel can be neatly integrated into the mixer. However, it won’t help people who need low latency for playing soft synths or guitar-amp simulators, and many of the 192’s rivals offer similar built–in DSP EQ and dynamics without compromising low–latency performance. For example, the RME Fireface UCX’s impressive round–trip latency performance remains exactly the same regardless of how extensively you use its built–in processing. It should also be borne in mind that even if a future Studio 192 driver update improves low–latency performance, it’ll do so only at the cost of disabling the UC Surface mixer and the Fat Channel altogether, thus eliminating a significant chunk of the system’s functionality. In this song, I’m not only controlling the 192’s preamps directly within the Studio One mixer, but also monitoring input channels directly and using the 192’s DSP Fat Channel as if it were a Studio One mixer plug–in. As a recording interface, the 192 turned in a good performance, faithfully capturing several days’ tracking. The preamps coped with everything I sent them, from close–miked snare and kick drums to fingerstyle acoustic guitar, and although I’m not sure I’d use the MIDI gain–control option in real life, the basic ability to set gain precisely in 1dB steps is a big selling point for me. Specifications for qualities such as dynamic range are more than decent, if not quite state–of–the–art, and I had no complaints about the sound quality. The analogue attenuator on the main outputs isn’t the most flexible form of output level adjustment, but avoids signal degradation and is reassuring in case of unexpected digital noise. The headphone outputs, meanwhile, have enough power for even the most Neanderthal drummer. It’s nice to have proper LED ladder meters on the inputs, too; in the review unit, there was a lot of light spill between adjacent LEDs, but apparently this was an issue that affected only the first few 192s off the production line, so should not be a problem in retail units. My sessions also made good use of the built–in talkback, which is an unusual and welcome feature in an interface at this price level. The 192 has its own mic embedded into the front panel for the purpose, though this is another aspect of the product that is less intuitive than you might hope. Talkback mic gain can be adjusted only from the front panel, and for some reason, is done by pressing the left or right arrows until the Pre LED shows a lower–case ‘c’ (for ‘comms’ — apparently there was no space for the letter 't'). Once you’ve done that, you can control who hears talkback by questing through the wastelands of Mordor to Mount Doom and — sorry, I mean by tracking down the Talk Assign button, which lurks behind an unlabelled white arrow in the master section of the UC Surface window. The in–built talkback mic has no mix fader, so you can’t vary the level at which it appears in different cue mixes. Moving to the mixing stage, I was pleased by the existence of a front–panel Mono button, as the ability to audition mixes and stereo mic configurations in mono is invaluable. I was a bit less pleased to discover that it has no effect on the headphone outs. In the review unit it also fed the full, unattenuated L+R sum to both outputs without any attenuation, so pressing the Mono button resulted in a drastic increase in level. This was apparently a firmware bug, which PreSonus tell me they have now resolved. USB 3: The Magic Number? It has been suggested that we’re on the cusp of a format war between USB 3 and Thunderbolt for the future of audio interfacing. I’ve tested several Thunderbolt interfaces on Mac OS, and most have delivered highly impressive round-trip latency figures, of the sort that would previously have been possible only with PCI cards. Many of PreSonus's resellers have implied that USB 3 should represent a similar leap forward in performance, but unfortunately, the reality does not bear out this idea. The Studio 192 does nothing that isn’t already possible over USB 2, and does it less efficiently. Since USB does not support 'stacking' of devices, it’s not even possible to exploit the greater bandwidth of the new protocol by connecting multiple 192s. For pure audio recording purposes, the 192’s poor low–latency performance is perhaps not too big a problem, since UC Surface provides such comprehensive low–latency mixing functionality. However, it will reduce its appeal to anyone who uses virtual instruments, guitar amp simulators, or other software that requires snappy response. 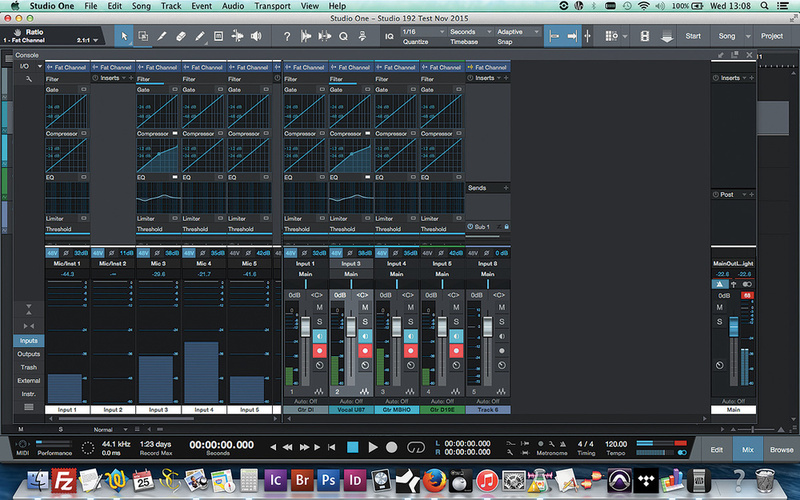 There’s also the fact that, personally, I found PreSonus’s new console utility pretty exasperating to use. I should emphasise, though, that this is a subjective judgement, and that other people might take to it like ducks to touch–enabled water. There’s no denying that UC Surface is very powerful and flexible, with plenty of unique features including comprehensive touchscreen support, so perhaps there’s simply a mismatch between what I find intuitive in a piece of software and what PreSonus’s engineers find intuitive. It's fair to point out, too, that PreSonus's own marketing does not major on the benefits of USB 3 or low latency. As far as they are concerned, the key selling point of the Studio 192 is the fact that it offers an unrivalled range of features for the price; and this is undeniable. There are other interfaces in this sort of price range that offer similar I/O counts, but not many that provide built–in talkback or digitally controlled preamps — both major plus points in my eyes — and none that offer the sort of close DAW integration you get with the 192 and Studio One. In the Mac market, the 192 goes head–to–head against Focusrite’s Clarett 8Pre, where these features and the 192’s extra bank of ADAT inputs need to be weighed against the Clarett’s better audio specs and superb low–latency driver performance. For both platforms, it’s also up against established and very good USB 2 interfaces from the likes of MOTU, RME and Roland. On present form, the Studio 192 doesn’t make a convincing case for the move to USB 3, but things can change awfully fast in this business. There have typically been two schools of thought in the design of control–panel mixer utilities. Some manufacturers offer a single mixer page which is hard–wired to the main outputs, with a system of aux sends that enables different balances to be sent to other output pairs for cue mixing. Others provide a completely separate mixer for each output pair, with its own set of faders, pan controls and so on. 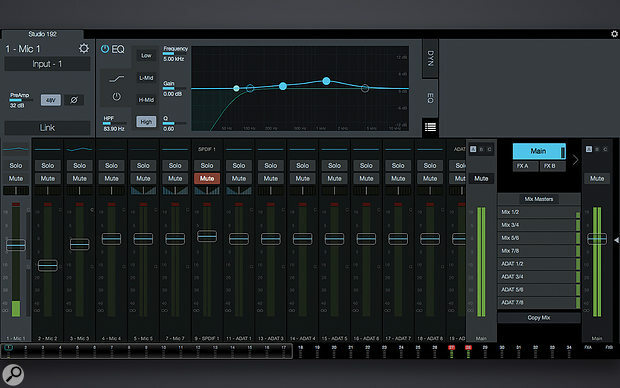 PreSonus’s earlier Virtual StudioLive utility fell into the former category, but the Studio 192’s UC Surface is in the latter; its master section at the right lets you select which output pair’s mixer is currently visible, and allows you to copy and paste mixer configurations between them. What’s more, almost all of the things I disliked about Virtual StudioLive have been fixed in UC Surface. The headphone outputs can pick up the main mix or any of the cue mixes; there are clip indicators (though the manual’s claim that these can be reset by clicking on them is, alas, untrue); channels can be named; faders go above unity gain, so sources can be boosted as well as attenuated; and soloing a source in one output’s mix leaves the other mixes unaffected. On paper, then, UC Surface is a huge improvement over Virtual StudioLive, and PreSonus have obviously put a lot of thought and work into designing their new console utility from the ground up. In practice, however, I found UC Surface rather unintuitive, often forcing me to hunt through the manual in the heat of a session to find out how to do something basic.Take headphone routing, for example. PreSonus describe the 192 as offering a total of 26 inputs and 30 outputs. Given its complement of physical I/O, the only way to arrive at those numbers is to count the two headphone outputs as each representing a stereo pair, and sure enough, the driver presents buses called Phones Left 1, Phones Right 1 and so on. You can select these as outputs within your DAW software — but this won’t actually do anything unless you go into UC Surface’s configuration page and deactivate its mixer. When the mixer is active, the headphone outputs have to mirror one of the other stereo outputs. And as there are no headphone–related controls within the mixer or master areas of UC Surface, it took me a while to discover that this is set up by touching the master fader to bring up its context–sensitive options. Easy once you know how, but would it have been so hard to put the headphone routing button somewhere it’s always visible? As well as Fat Channel processing on the inputs, UC Surface also provides global reverb and delay effects. Or take the built–in UC Surface reverb and delay effects. Whichever pair of outputs you’re mixing to, you’ll find two faders at the extreme right of the mixer labelled FXA and FXB, with greyed–out solo buttons and the words Reverb and Delay written above them. Call me naïve, but I rather expected that touching the word Reverb might take me to the setup page for the reverb effect. Not so. It turns out that these are merely ‘dumb’ effect return faders. To actually do anything useful with reverb, you need to track down a button in the master section labelled FX A. All the faders in the mixer then turn purple, indicating that you are now viewing the reverb send fader for each channel. This also conjures into existence a second fader labelled Reverb, this time in the master section; and here, finally, you can access an FX Edit button to sort your large halls from your small plates. While I appreciate the consistency and the touch–friendliness of using faders for everything, it does seem daft to me that the only way to add more or less reverb to a source is to switch the mixer to show the global sends view. Why is it not possible to adjust send levels from a channel’s context–sensitive Fat Channel view? And why give the effect return channels ghostly solo buttons which are inoperable, instead of real mute buttons which would actually be useful? And couldn’t PreSonus have used different colours for the reverb and delay views, instead of making them both purple? Or take panning. The first time I used the 192, I was nonplussed to find myself hearing playback in mono. Scrolling along the UC Surface mixer window, I discovered that all of its channels — including the playback channels returning from your DAW — default to centrally panned mono. To hear your DAW playback in stereo, you need to scroll to the relevant part of the mixer, select a channel and hit the Link button. Sounds trivial, but I found someone on the Internet who had actually returned his 192 to the shop because he hadn’t been able to figure this out, and I don’t entirely blame him. Channel linking, it turns out, affects every mixer within the UC Surface application, whereas channel pan controls, mutes and solos are unique to each mixer. This brings further potential for confusion, because if you link two mono channels and then unlink them again, their pan controls are set hard left and right in all mixers, regardless of what they were set to before you linked them. Oh, and while all the mixes that are routed to outputs are stereo, the mixer views that display reverb and delay sends are mono. All of these are things you’d no doubt get accustomed to with time, but they can be confusing to the uninitiated, and it’s fair to say there’s scope for some further refinement in UC Surface. And, though it’s hardly PreSonus’s fault, the lack of multi–touch support in OS X means Mac users don’t benefit so much from the touch–based design. At any rate, I found UC Surface frustrating to work with, but even so, it’s certainly an improvement over the old Virtual StudioLive; pretty much everything you’d ever want to do in a cue–mixing utility is at least possible, even if it’s not always obvious how to do it. The Studio 192 comes with the Artist version of PreSonus’s own Studio One recording software, which has recently had a comprehensive, touch–focused overhaul; the latest version 3 of Studio One was reviewed at length in the September 2015 issue of Sound On Sound. Previous PreSonus interfaces such as the 1818VSL have benefited from a degree of integration with Studio One, and the Studio 192 takes this quite a bit further. For one thing, parameters for its digitally controlled preamps are accessible directly within the Studio One mixer, so if you’re not getting quite enough level from your cowbell mic, you can simply click and drag to boost it, without needing to touch the unit itself or visit the UC Surface software. As before, it’s also possible to perform the kind of low–latency cue mixing you’d otherwise need to do in UC Surface within the Studio One mixer. Any Studio 192 output can be designated a Cue Bus, and doing so makes sends to that bus appear automatically in the mixer channels. Clicking a little ‘Z’ icon means that Studio One's aux sends are actually controlling the 192's DSP mixer, routing inputs to outputs without passing through the driver or any Studio One buffers. By default, cue mix send levels follow the level of the channel fader, but you can set them independently if you want to have different cue mixes appearing at different outputs. What’s new is that it is now also possible to employ and configure PreSonus’s Fat Channel processing on inputs that are being monitored with low latency. On any mixer channel set to receive one of the 192’s analogue inputs, you’ll see the Fat Channel as an additional insert processor prior to the conventional inserts. It can be opened, edited and auditioned from within Studio One, even though it’s actually running on the 192’s DSP. You can even choose to place it in the record path if you like; if not, then simply dragging it into the main insert area will let you hear your recorded audio played back through a non–DSP instance of the Fat Channel plug–in, so it sounds exactly as it did in the cue mixes. It’s a very well thought–out system, and in practice, means that if you are using Studio One as your DAW, you rarely need to venture into the UC Surface application at all. In this Studio One Expert video, Marcus Huyskens gives a detailed overview of the hardware integration between the Studio 192, and Studio One 3.1. Digitally controlled preamps, and true line inputs that bypass them. UC Surface provides a flexible, touch–enabled monitor mixing utility with extensive DSP. 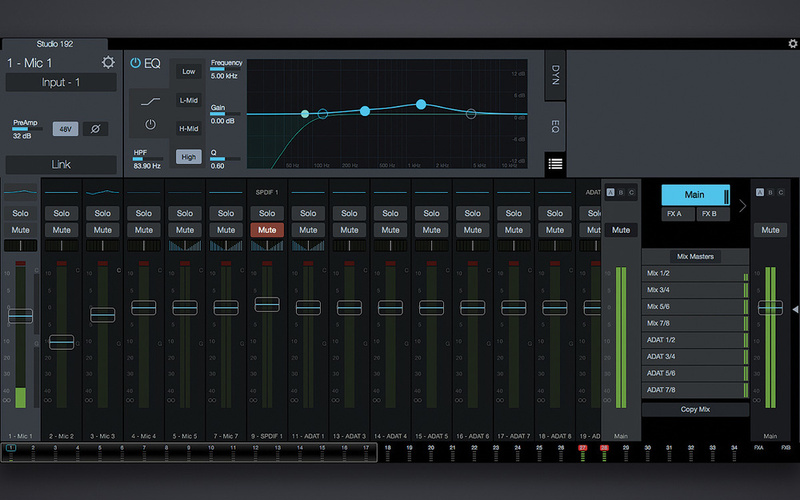 Close integration with PreSonus’s own DAW offers low–latency monitoring with DSP effects, within the Studio One mixer. Low–latency performance is worse than that of typical USB 2 and Firewire interfaces. Can’t be used as a USB 3 interface with present versions of Mac OS, though it works well over USB 2. The move to USB 3 doesn’t appear to have enabled any functionality that wasn’t already possible with USB 2 in any case. UC Surface is obscure and counter–intuitive in use. PreSonus have made a bold leap into uncharted waters with their first USB 3 interface. From the hardware point of view, it offers a lot of features for the money, but aspects of the driver and control software will diminish its appeal for some users.